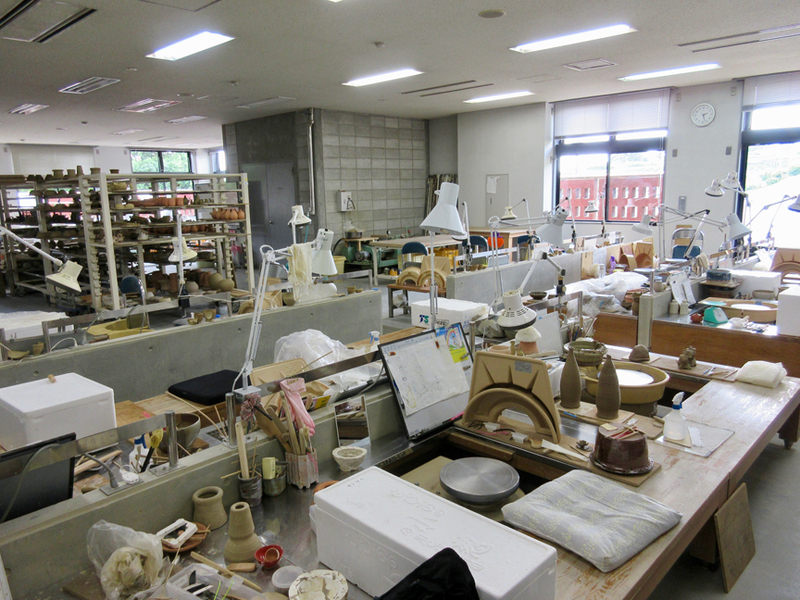 This was my last week at Tokyo Ryusen Studio, which included a trip to the famed pottery town of Mashiko, as well as a more modern pottery center in nearby Kasama City. At the studio, I refined my trimming techniques on the bottles I made, using a chuck. 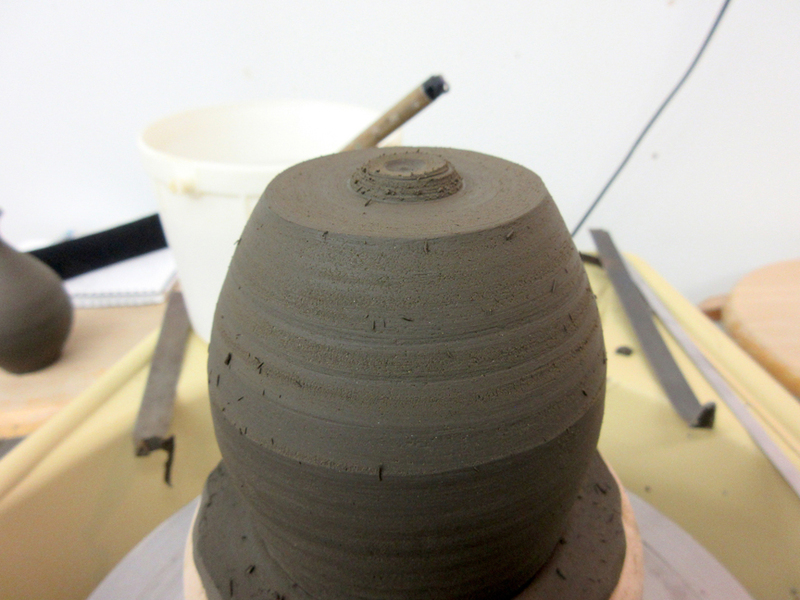 Note the trick of leaving the centermost part of the foot untrimmed to keep track of how much clay I’ve removed. 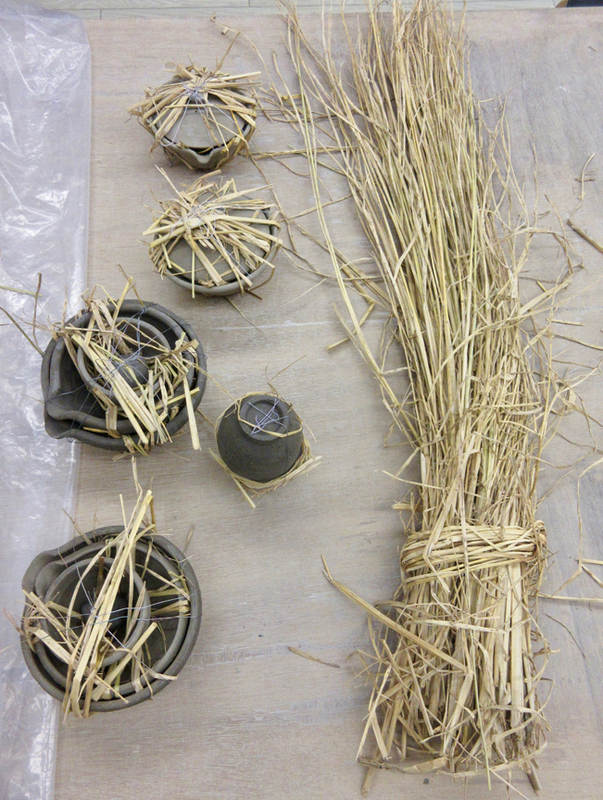 We also wrapped our Bizen clay pieces from last week in rice straw for firing. 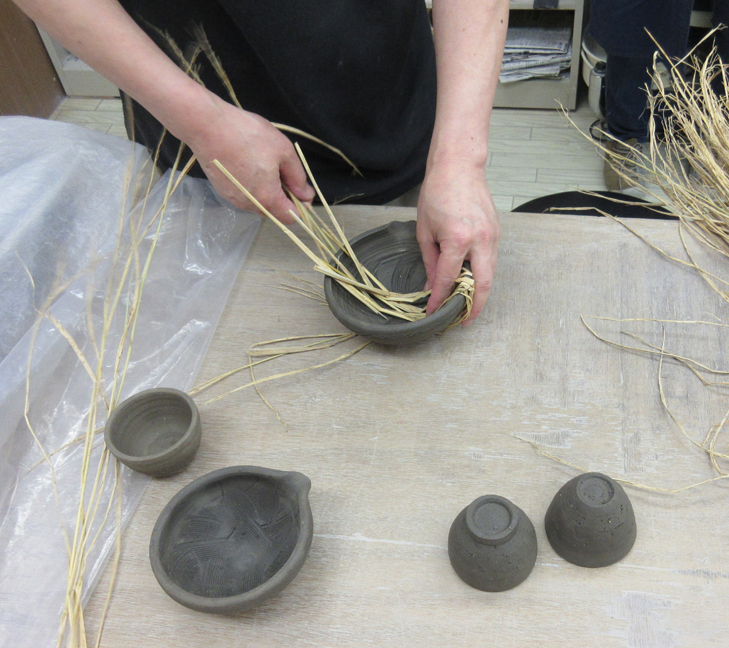 The rice straw burns away during firing, leaving bright orange-red lines on the otherwise unglazed or decorated ware. See the picture below of a finished example by Bizen artist, and national treasure, Jun Isezeki. 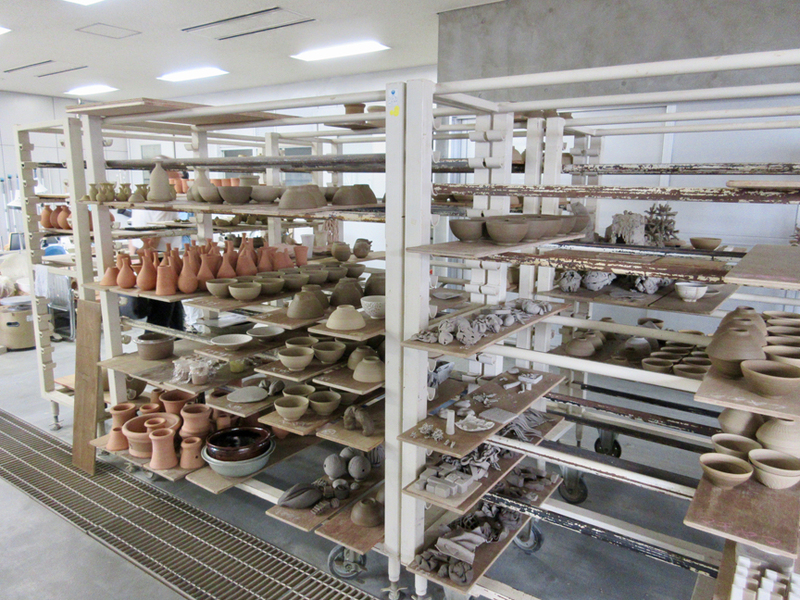 I saw Isezeki-san’s work at the Ibaraki Ceramics Museum, in Kasama. Finally, I learned a new decorating technique using Japanese rice paper (washi). 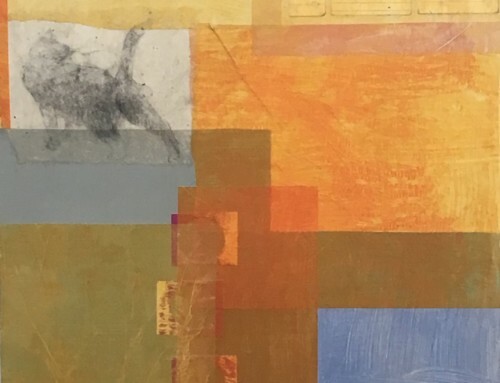 Here, the paper is cut into stencils and dampened with water. 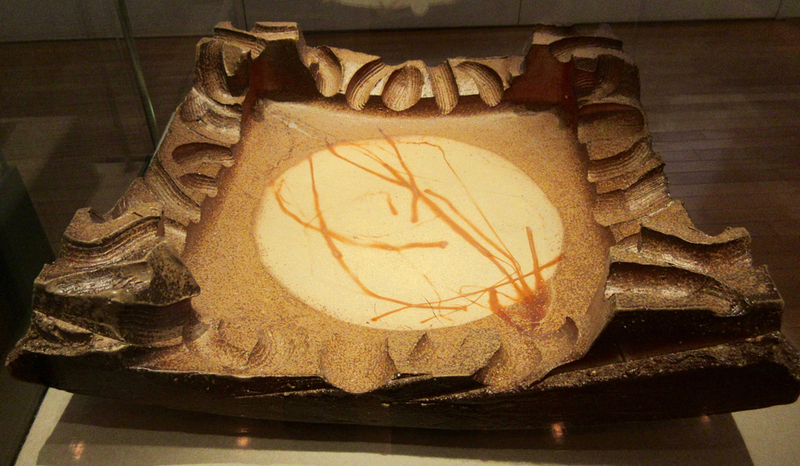 After positioning the stencil on bisque ware, such as a plate, the artist applies a solution of metal oxide, such as cobalt, or chrome oxide, mixed with tea. 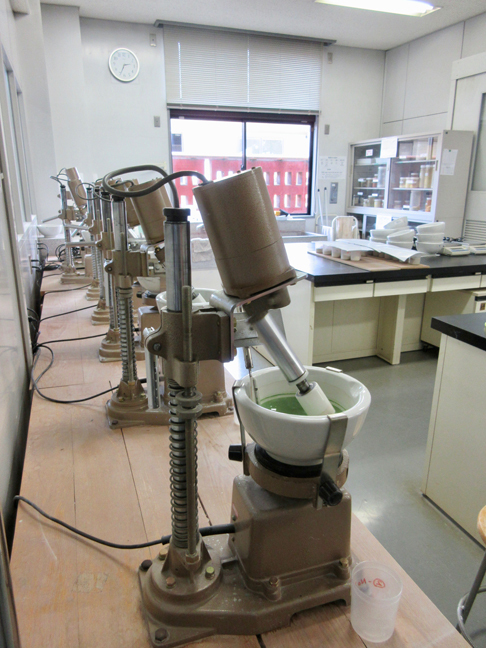 Koichi-san was very clear that you use tea, and not water, in mixing the colorant. 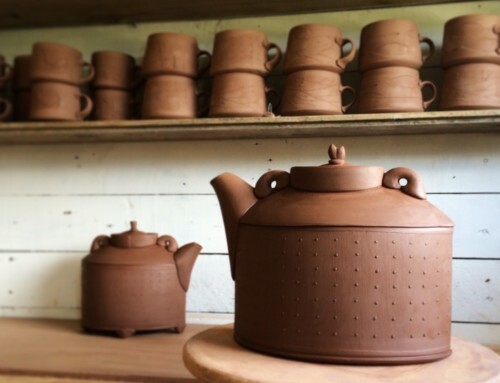 I believe the tea acts as a binding agent, fixing it onto the bisque surface securely until firing. 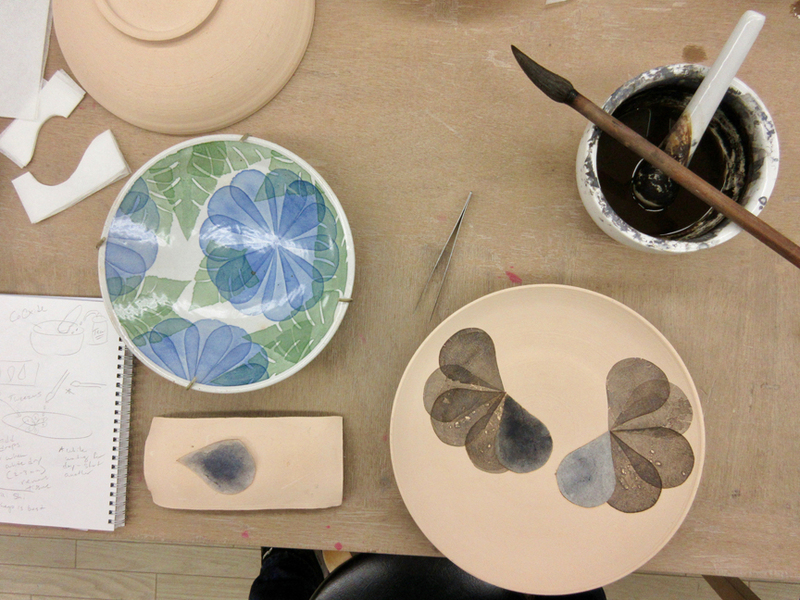 A finished plate, along with my practice piece. 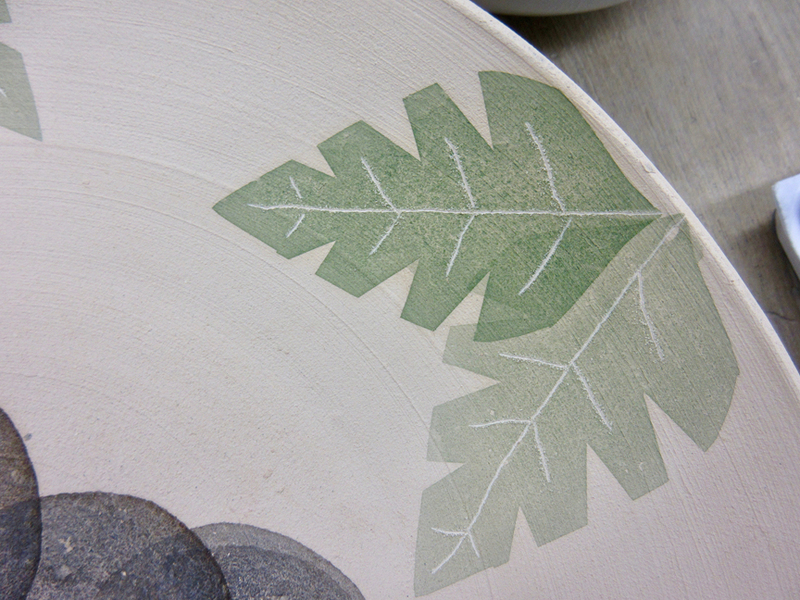 Detail of my practice, showing leaf veins scratched in with an engraving tool. Thursday Koichi-san and his wife Emi took me to Kasama and Mashiko, two pottery towns about 2 hours north of Tokyo. I previously visited Mashiko in 2008. It’s definitely a pottery Mecca, founded in the mid 19th century and then popularized by Shoji Hamada in the early 20th century. Today over 380 potters call it home. We mostly came to Mashiko to buy clay for the studio. The clay supply stores we visited were very similar to those I’ve seen in the U.S. – a retail showroom and a warehouse of raw materials and clay. 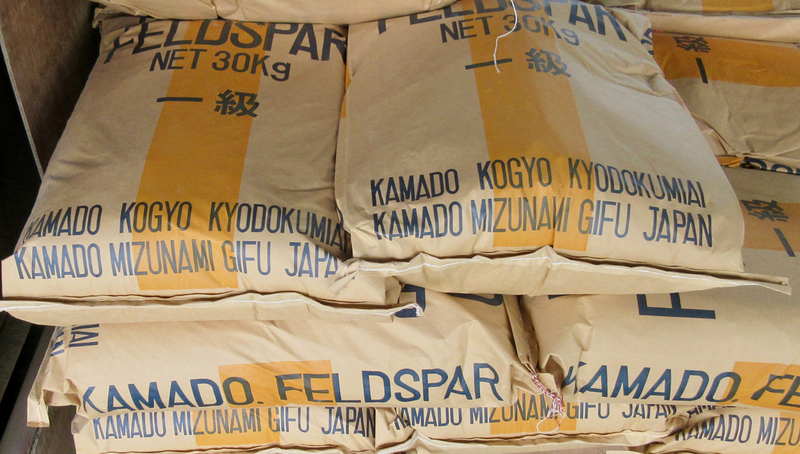 Of course, the tools and materials varied from what you see in the U.S. – for example, 25 kg bags of rice straw ash, and clay sold by place of origin, instead of brand name – but they also carry familiar products such as AMACO under-glazes and prepared glazes like those Leslie and other U.S. providers carry. 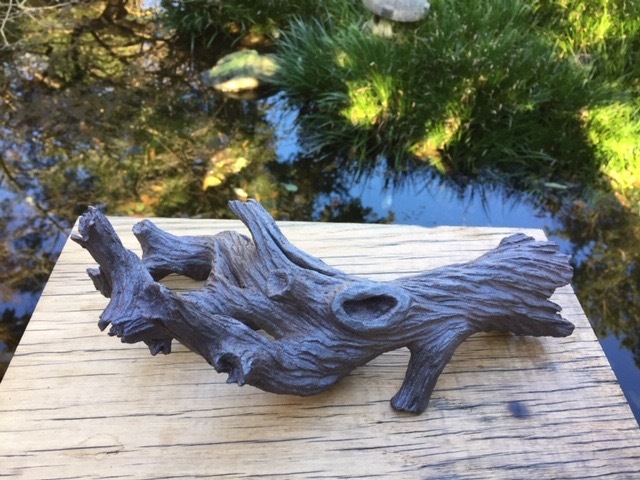 Perhaps one of the biggest surprises was the price of clay. 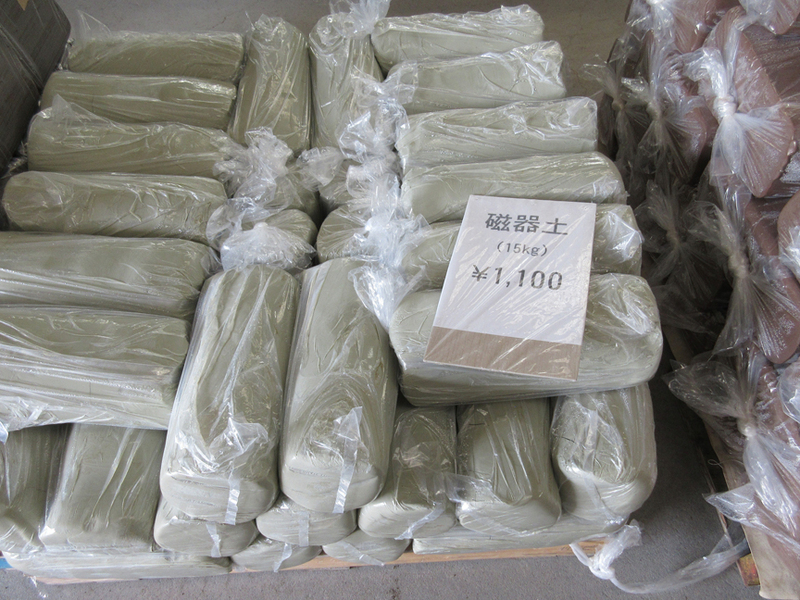 A 15 kg of porcelain sells for ¥1,100, or about $10 U.S. – a bargain! Keep in mind, though, that you drove two hours from Tokyo to get it, and good luck shipping it back to California. Kasama is a larger city, about 20 minutes from Mashiko. 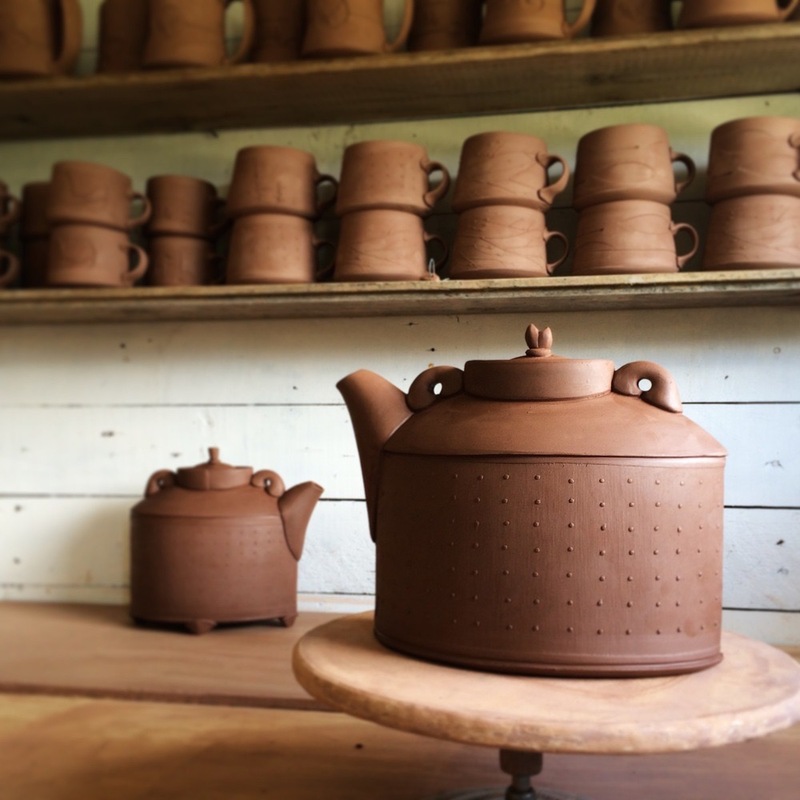 In addition to numerous potteries, shops and galleries, Kasama is home to the Ibaraki Ceramic Arts Museum, and the Kasama College of Ceramic Arts. You know this town loves ceramics when one of the main streets is called “Yakimono Dori” (Pottery Street). 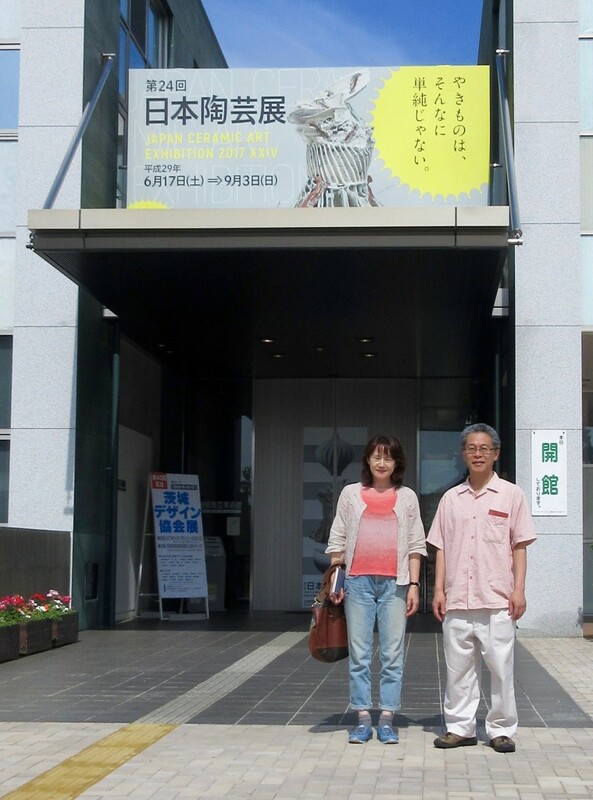 The museum purchased one of Koichi-san’s pieces for it’s permanent collection, and we were there to deliver it. I was honored to be introduced to the director, Kenji Kaneko, an energetic ceramics enthusiast who is also the president of the ceramics college. After copious amounts of green tea, we sojourned to lunch and then a tour of the college. Fantastic facilities – the college offers both fine arts programs as well as more technical, industrial and applied ceramics classes. Here are a few shots of the facilities available to students. On our way back down Yakimono-dori, we stopped at a beautiful gallery and shop called Mon (Mon meaning “gate”). The building had a Spanish architectural feel to it, featuring a large open interior courtyard and garden, surrounded by a covered walkway. 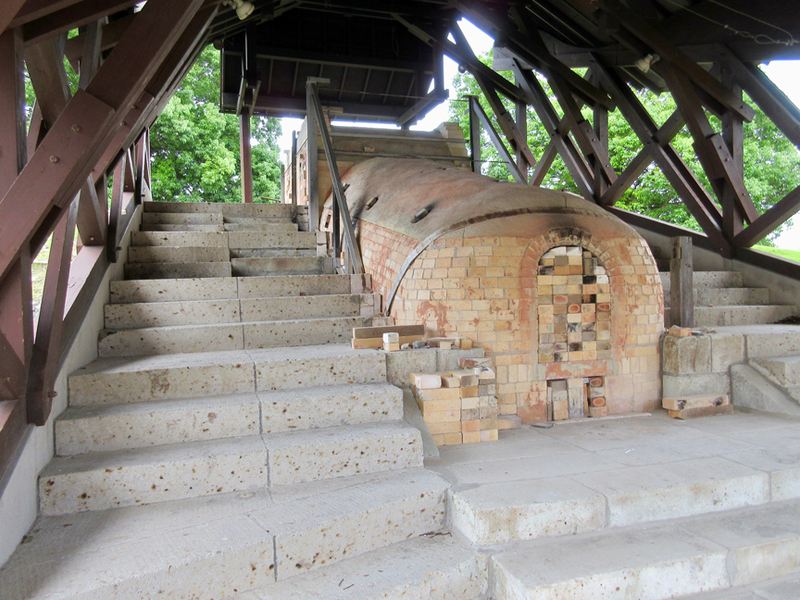 Works are displayed around the walkway on heavy slabs cut from whole trees and in antique cabinets along the walls. 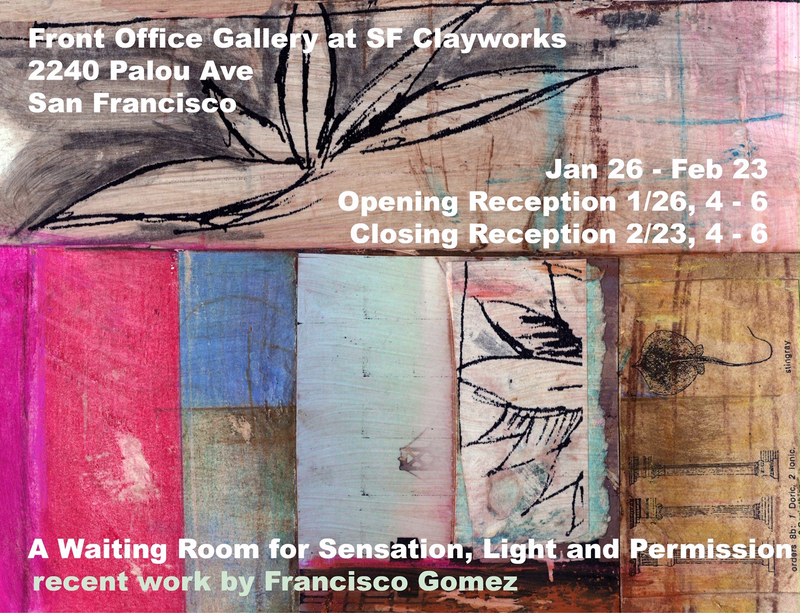 The space itself was gorgeous, and the work well curated. In addition to functional ceramics, the gallery sells hand-blown glassware and a few other functional metal and textile crafts. The gallery website gives you a small sense of how inspirational the space is, I’m sorry I was a little to shy to take pictures of my own: http://www.gallery-mon.co.jp. While I am recommending galleries, I want to give special mention to Rozan, in the Nishi-Ogikubo neighborhood of Tokyo. 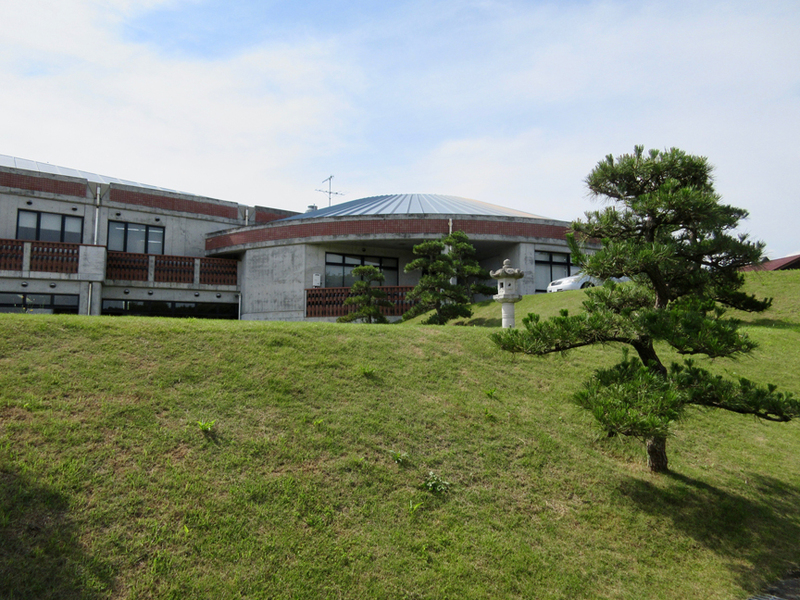 My friend and poet, Reverend Mizuho Ishida, took me to visit Rozan and introduced me to its owner, Fumihiko Oshima. Definitely worth visiting if you come to Tokyo and are interested in contemporary functional ceramics. 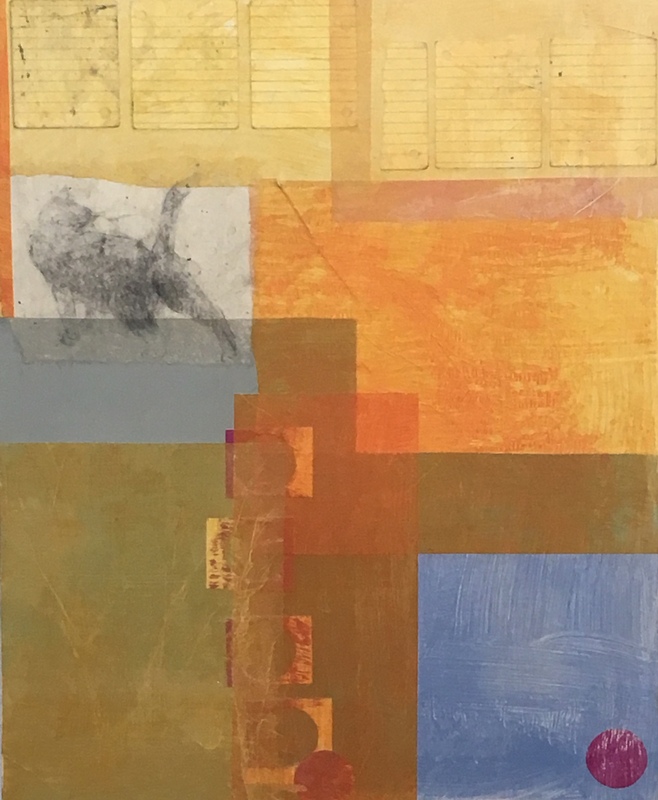 Fumihiko-san brings in works from different artists each month, and has an eye for artists who know the how to challenge tradition with respect. 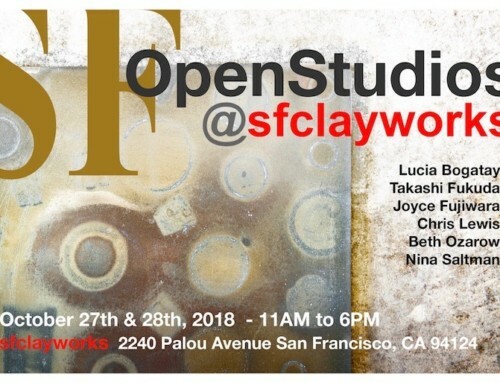 The works I saw were technically well made, but not stiff or mechanical – the artists build on recognizable Japanese styles with a sense of youth and liveliness often missing in functional ceramics. Fumihiko-san named his shop in reference to an iconic figure from the mid-20th Century art scene, Kitaoji Rosanjin (1883-1959). If you are not familiar with the work of Rosanjin, you may want to check it out. A good introduction can be found here: http://www.toki.tokyo/blogt/2017/20/2/2/life-kitaoji-rosanjin. I think I should wrap this up – it’s difficult for me to accept this trip is coming to an end, but the friends I’ve made and inspirations I’ve gained will keep these experiences alive for a long time. Before I go, I want to give a quick plug to a unique and inspiring event Rev. Mizuho-san organized at a temple in the up and coming Kuramae neighborhood. The event brought together poetry, calligraphy, Buddhist chanting and Butoh dance in a temple and its adjoining gallery space. Did you get all that? 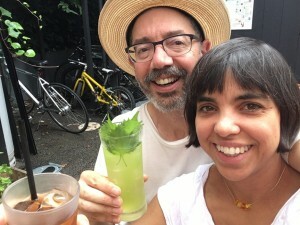 I’ll let Mizuho-san give you a sense of the beauty through his blog here: http://mizuhosperch.blogspot.jp. My wife Judy read some of her work at the event, and I have to add that the after party was a blast! 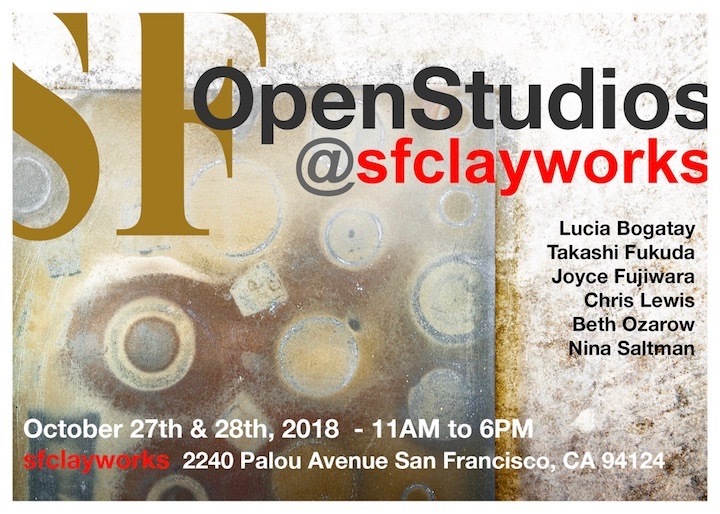 Of course, I cannot sign off without giving my deepest thanks to my teacher, Koichi Koyama, and his wife Emi, who’s ceramic experience and English language skills added much to my learning. I also want to thank two other women who help out at the studio, Akiba-san and Aok-san. Domo arigato gozaimasu! Finally, I must thank my wife Judy, who made this all possible.